Freddy and I got the usual breakfast at Agua Java before cruising down to the beach around noon. There wasn't much wind yet, maybe the occasional puff upto 8 MPH. I decided to borrow the stand up paddleboard from Worldwinds, a Mistral Pacifico. A stand up paddleboard is a long surfboard intended for paddling from a standing position. At around eleven feet, the board looks gargantuan compared to the usual short boards. Worldwinds didn't have the proper paddle for the Pacifico yet. Instead, they made a Swiss Family Robinson paddle using a canoe paddle, a chunk of mast, electrical tape, and probably some coconuts. It works, even if it probably cost a few hundred dollars less than a proper paddle. I asked Rob for advice on how to use the Paddle Board. Rob is a windsurfing pro who has been hanging around Worldwinds for a while. He gave me a few pointers on the operation of the board before I embarked. Of course, the first thing I did was to step on the side of the board instead of the middle. Duh! After stumbling I remembered to step on the centerline. From there, it actually felt fairly stable as I took position on the board. Unlike a normal surfboard, the standard position on a paddleboard is to face squarely forward, legs shoulder-width apart, toes facing forward. Unless you're riding a wave, but not many waves disturbed the face of Laguna Madre today. The top of the Pacifico (entirely covered with a nice foam pad) is marked with a nice tan oval. Rob advised to keep my feet within the oval for stability. I could walk towards the nose to raise the fin in shallow water, or towards the back to lift the nose. Although keeping my feet wide near the edge of the oval felt strongest and most stable for paddling, walking up and down the board this way felt tippy. Walking along the centerline felt quite stable. I paddled in the shallow water to get my sea legs, and then decided to go investigate some curious man-made structures along the shoreline. Paddling the board isn't exactly fast -- I'm fairly certain that a kayak or canoe would have been faster (although I admit the problem could be my paddle technique). However, I think I prefer standing up while moving. The view is better, and standing feels a lot more comfortable than the typical canoe or kayak seat. The Paddle Board also can be a lot more maneuverable than a canoe in certain cases. If you trot to the tail and sink the back, the board becomes quite easy to spin around. If you're in a contest to turn around, the Paddle Board will definitely win over a canoe. As I tried to return to Worldwinds, I discovered why Rob warned against paddling back against the wind. Even though the wind came from the side, I had difficulty keeping the Pacifico tracking straight. Unlike a canoe, which generally has a keel to help the worst paddlers move straight, the Pacifico only has a fin at the back of the board. Proper technique, and forward headway is critical to staying on course. I'm not saying I had either, but I think it would have helped. Also, I suspect that there are better places to stand on the board when the wind picks up. Since my body probably acts like a sail, maybe the place to stand is further back, closer to the fin. Honestly though, I just brute-forced it. I paddled stronger, really putting my knees into the stroke. That helped. Once I got back comfortably close to Worldwinds, I noticed that Jason had finally arrived and made it out on the water. He was out trying to perform a water start. I was able to paddle right up to him and have a chat. There is something to be said for not having a huge sail hindering you when you're just trying to stand on your board and chat. As I discussed water starts with Jason, I got to stand tall astride my golden Pacifico. Jason got to stand in the muddy bottom of Laguna Madre. I bet Paddle Boarding with friends would be a bit more social than windsurfing -- but where are the beer holders on this thing? As I paddled away from Jason, I attempted to show off with my fancy tail sink 360 move that probably has a real name. I fell into the water instead. Of course! My first time falling off a Paddle Board, right when I'm showing off. Pity. After fooling around a bit more, I returned the Pacifico and broke out my own gear for some windsurfing. Unfortunately, the winds remained mostly light with the occasional gust clocking from odd directions. I spent most of the day sailing with my weight and the sail forward to help me follow the changing wind directions. Occasionally I got pushed briefly on plane, but mostly it was a low wind day. I'm not complaining though, the weather was at nice, and any day on the beach is a good day. Freddy, Jason, and I all got off the water early so we could get to Cirque Du Soleil's Saltimbanco on time. For dinner, we stopped at the Island Italian Restaurant and devoured their awesome sandwiches. We all met in the Best Western lobby after cleaning up. From there, we walked along the sea wall to the American Bank Center Arena. I thought it was neat how a mix of tourists, joggers, and Saltimbanco audience were wandering on the sea wall. As we approached the arena, we knew we were going the right way because the concentration of well-dressed Cirque goers increased. Inside the arena, a brightly colored stage was partially covered by a white tent, obscuring the middle and back portions. Suspended above the stage, a decorative circular structure of interlocking rings held lighting equipment. As everyone got their seats, some colorfully dressed performers came out on stage and began performing skits. These skits mostly involved pantomime, funny sounds, and audience members. If you want to become part of the show, front row seats are your best bet. Finally the show actually started and the "tent" was pulled back to reveal the stage, some acrobatic apparatus, and a live band. From that point on, the show became intense. There were trapeze girls who hung from each other's feet. A biker who rode a bike just about every way imaginable. Acrobats launched from giant swings to land on the shoulders of colleagues. In each act, the whole stage was alive with performers crawling and rolling and running as if they were catnip addicts. After the show, we walked to Havana to get another round of tapas and mojitos from Stephanie. As we ate "El Infidel", we reflected on the crazy awesomeness of Cirque. To round out the night, we paid visits to Club 21 and Bourbon Street. Other than accusing a few women of following us around, we didn't get into too much trouble at the clubs. Returning back to the hotel, we discovered several women riding hotel luggage carts down the sidewalk. I interrupted their fun to chat and try out the luggage cart. One of the cart racers insisted that she had never at any point worked for the hotel. Of course she had. Who else would know how to ride a luggage cart? How else could she have recognized me as a hotel regular? Defying death in a luggage cart seemed like a good end to the night. We said goodnight to the ladies. As expected, Freddy, Gumbo, and I woke at the crack of dawn for the drive to Corpus Christi. On the way to the beach, we stopped to drop Gumbo off at the hotel. Hilarity ensued. 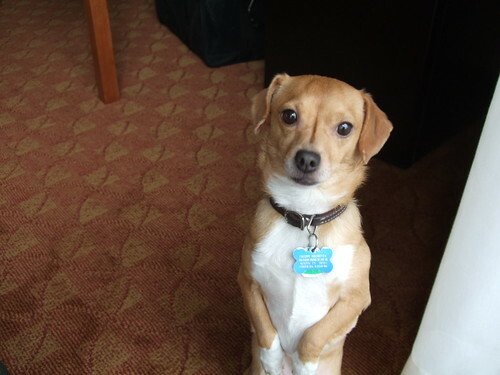 The previous weekend, Freddy had left his cellphone charger in the hotel room wall socket. He called the hotel the very next day to ask them to look for it. They agreed to investigate. We now asked the front desk about it in person. Did they find the charger? Nobody knew. But they did have "hundreds" of chargers for us to look at. None of them matched Freddy's phone. In the mean time, Freddy and I decided to get Lunch at the Hooters on the way to Worldwinds. This time I got the "Three Mile Island" sauce on my buffalo chicken sandwich. Much better -- this sauce had flavor! At the beach, the wind was gusty. I managed to get on plane a few times, and I pulled off a few water starts. Freddy practiced using his harness and performing tacks. After a day of sailing, we cleaned up and paid Havana another visit. We ordered Mojitos and a bunch of tapas: an "El Infidel!" sandwich, Ropas Viejas, and roasted plantains. I enjoyed all of it, especially El Infidel. We asked Stephanie the waitress about the sauce for "El Infidel!". She read the menu and told us it was cilantro aioli. Somehow the word aioli struck our funny bones. It became the official word of the trip. Over Mojitos, Freddy and I devised a fantastic prank. You see, at a particular company, all the executives get Starbucks coffee in their break room. The engineers get coffee that nobody could even be bothered to name: Brand coffee. I'm told that Brand approximates the flavor of dried, recycled Folgers grounds combined with a hint of paint thinner. We came up with a plan that combines princess and the pea and the Folgers taste test. Our hero would sneak into the executive break room and refill a sack of Starbucks with Brand. Ideally, a nice fresh pot of Brand could be made too. Do you think the big-shots would pretend to like it if the bag was labeled Kopi Luwak? 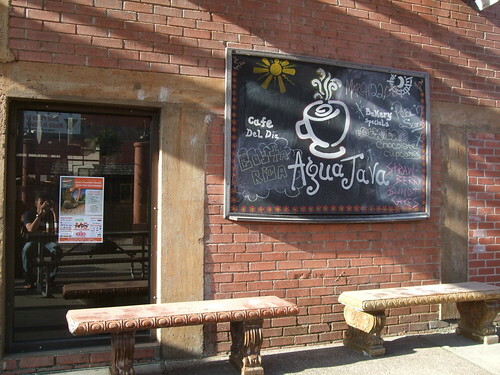 At breakfast, we all met at Agua Java for the traditional coffee and treats. Freddy and I planned our brunch, while James and Jolyon braced for the long drive back to Florida. Near noon, Freddy and I paid a visit to Hooters. We had (at least) two goals in mind: eating spicy food, and gathering intelligence on the nightlife. Valarie was able to help us with both. Sorta. I ordered a Buffalo Chicken Sandwich (hot) with bacon and cheese. It tasted OK, but I didn't feel that bacon and cheese really added to the flavor too much. Next time I'll skip it. Also, I found the "hot" sauce weak. I'll go three-alarm in the future. 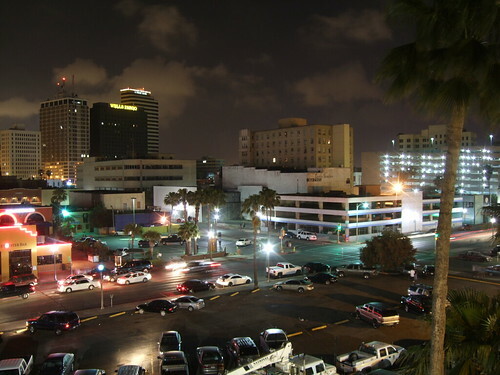 When we asked Valarie about the nightlife, she asked us if we knew where Staples was. Freddy and I immediately laughed at her. Do the ladies dig office supplies? Nooooo, Staples is a street name. At Worldwinds, the wind teased us. It frequently gusted me on plane, but never kept me there long. 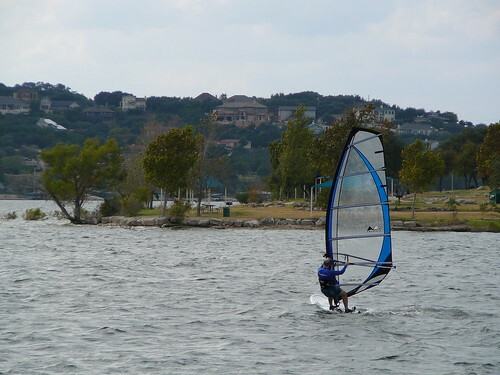 In addition, I noticed a second group of windsurfers sailing in a nearly perpendicular direction to my own. I ran into Freddy and Randy just as Freddy's harness class ended. I mentioned the weird shifty wind, and Randy pointed out to me how further up the beach the wind came from a different direction and stronger. Strange! I sailed out to the mystery wind and managed to get on plane for a bit longer than before. Quirky. After using up the wind, Freddy and I returned downtown to desalinate. For dinner, we decided to try something new. We went to Havana to drink Mojitos and eat Tapas. We enjoyed "El Infidel!" sandwiches, some Cuban bread, Arroz con Pollo, and some tasty marinated steak. After trying to get our waitress to laugh, we got bad directions to Club 21 and attempted to follow them. Freddy and joked as we walked how all directions in Corpus Christi have you go two blocks in "that direction", make a left, and walk two more blocks. Do the natives navigate by smell? After proving the directions wrong, I asked some random girls how to find Club 21. "We're not from here. We're from Austin!" was the proud response. We responded the same, and learned that they were really from Georgetown or some such non-Austin place. Busted! Eventually we found the bar -- really called Katz Club 21. The place was nice, but not the hive of women we were promised. The bathroom attendant explained that all the women were at some concert -- usually the place was packed with them! Hmm. I don't care much for the bathroom patrol or the ratio. Freddy and I discovered another bar inside the Katz restaurant: a small, empty lounge. The general manager was hanging out here, and chatted with us for a while. Freddy and I returned to the main bar to watch the band and the dancing drunks. As we chatted, some mystery admirer bought us some shots. Since no princess came to join us, we figured the GM sent them our way. We enjoyed club 21 for a while more before trying Bourbon Rocks, which felt even more gender imbalanced than club 21. After the bars closed, we returned to the Best Western where we discovered three women chatting in the hallway. They didn't seem to want to chat with Freddy or I. Time to escalate. We spent the next two hours chatting with the hall monitors, watching the spring break drama unfold in the other rooms. One room had an unintelligible argument concerning fidelity and slamming doors. Another had a constant train of odd characters intent on violating the hotel smoking policy. 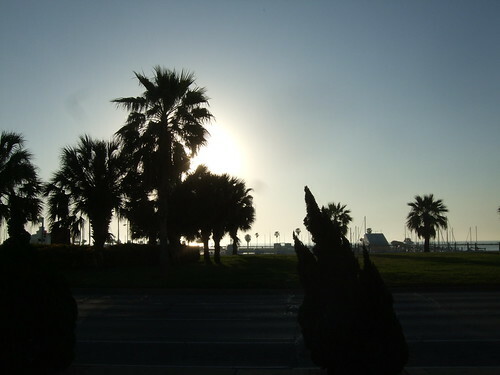 It lent a nice Spring Break atmosphere. Friday morning we all woke up early for the drive to Corpus Christi. James and Jolyon left at 7:30 am so they could arrive in time for their beginner lesson. Freddy, Gumbo, and I soon followed in The Orange Toaster . Freddy and I got subs at Island Italian after dropping Gumbo off at the Hotel. At the beach, the wind was adequate, but not quite planing speeds -- at least for me. While James and Jolyon took their lessons, Freddy rented a 180 x-cite ride and a 5.5 meter sail. I used my personal rig: a JP Australia X-Cite Ride 145 and a 6.5 meter sail. As the day wore on, the wind increased in strength. Gradually the wind grew until I was able to stay on plane the rest of the day. To top it off, the few times I needed to, I was able to beach and water start. I even was able to really steer while on plane. It was probably the best windsurfing day I've ever had. Freddy had a good day too, he swapped his 180 in for a smaller 160 liter board. James and Jolyon enjoyed the surfing too. James thought he preferred traditional surfing, but Jolyon seemed really into windsurfing. For dinner, we ate at Waterstreet Seafood Co. I enjoyed a Wasabi Seared Tuna. So did Freddy. So did James. After dinner, we walked around the Marina before calling it a night. We were all pretty tired from the surfing, driving, and waking up early. April drifts closer. 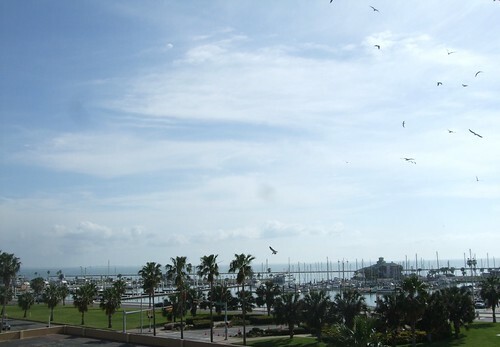 Lets start planning the next trip to Corpus. Communicate your availability by commenting below.